Crater Lake from the Rim Trail. 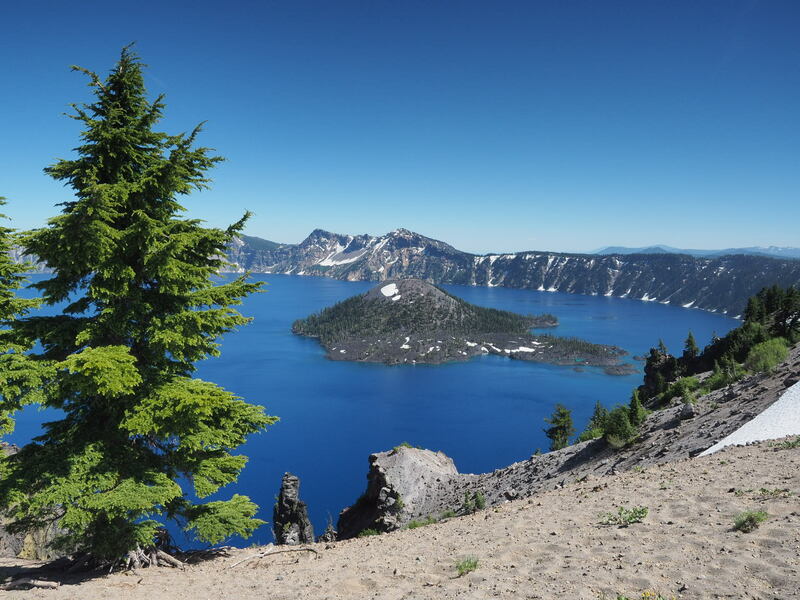 Crater Lake truly is a wonder and we had a beautiful day to hike up to the Rim from Mazama Village. We departed early and a hiker named Thug Life offered us a ride the mile and a half back to the Pacific Crest Trail trailhead. We hiked up the PCT to Dutton Creek where the Crater Lake Rim alternate route begins. Rumors were circulating among the hikers back at Mazama Village of treacherous steep icy trails on the trail to Rim Village but we didn’t find anything dangerous, just a half mile of relatively easy snow. Reaching Rim Village you see the first views of Crater Lake and it’s always amazing. Our hike followed the Crater Lake Rim about five miles around the lake until it splits off to the north toward Mount Thielsen. We have arrived in Mazama Village in Crater Lake National Park after hiking 102 miles on the Pacific Crest Trail from Ashland, OR. It’s been a wonderful hike so far, starting off relatively easily, but the past few days had some snowy surprises. The first days were lovely hiking along gentle forested trails. We resupplied at the Fish Lake Resort on day four, after an interesting morning hiking through the Brown Mountain Lava Flow. It’s amazing how the trail builders managed to put a trail across the jumbled lava rocks. From Fish Lake the PCT climbs past the eastern side of Mount McLoughlin to the Sky Lakes Wilderness. We resisted the urge to make the 2,000 foot hike to the summit. Unfortunately, in the Sky Lakes Wilderness hundred of trees have blown down across the PCT. Most are not hard to step over or around, but it just makes the hiking a little more difficult. We also had a fun little glissade down the northeast side of snowy Devils Peak and a not so fun three or four final miles of snow covered trail just before Highway 62. Today is a zero day in the Mazama campground as we are organizing the supplies we mailed to ourselves, cleaning up, and eating a couple of restaurant meals. We are camping tonight next to Marc and Julie, full time RVers of RVLove.com fame, who we briefly met at an RV event earlier this year in Quartzite, AZ. Deb has faithfully followed their blog ever since. They graciously offered to share a campsite after a chance encounter outside of the Mazama camp store. It’s been fun getting to know them and compare notes about RV and hiking life. We haven’t actually seen Crater Lake yet, that’s about five miles of hiking to the north, which we will do tomorrow. It’s been awhile since I posted here, but tomorrow we begin hiking across the state of Oregon on the Pacific Crest Trail. We will start near Ashland, OR and plan to hike about 430 miles to Cascade Locks on the Columbia River. We have spent the past few days scurrying about the Medford area buying hiking food and shipping it to various locations across the state. Oregon has many remote lodges, church camps, and rustic resorts near the trail that accept resupply packages from hikers. Along most of the PCT it’s possible to resupply at one of these locations every 50 or 60 miles and we are taking advantage of almost all of them to lessen the weight of the food we have to carry. Oregon has a reputation among PCT thru-hikers as being an easy state where they can often hike 30 or 40 miles per day. In large part, that’s because the thru-hikers have hiked 1,700 miles before they arrive here, and they are in fantastic hiking shape. That won’t be us, we are planning a relaxed hike at about half that pace. We might run into some snow starting around the Crater Lake area, but hopefully it will mostly be melted by the time we arrive there. Our fingers are crossed that the mosquitoes won’t be too bad, but we have our bug nets and repellent ready. Dale and Melissa (family) have been a huge help here in the Medford area. We really appreciate all their help and assistance as we start this hike. It’s been awhile since I updated the blog, but the new shoes I purchased back in Helena, MT worked out well and carried me through the rest of Montana and Idaho. After finishing the Montana/Idaho sections of the Continental Divide Trail I decided to hop off the trail and save Colorado and Wyoming for next year. I have rejoined Deb in the RV and we are currently exploring Colorado. Hiking the Montana sections of the CDT was amazing, it’s a really beautiful trail and great hiking. I met wonderful people hiking and in the small towns where I stopped to resupply along the way. After Helena, I took the Anaconda Alternate which was a bit of a disappointment. It’s basically a 90 mile shortcut that involves a 45 mile road walk. Someday I will return to Montana and hike the official CDT around Butte, MT. I resupplied in Darby, MT via Chief Joseph Pass (thanks Jesse for the help); Leadore, ID via Bannock Pass; Lima, MT via Highway 15 (thanks Cindi for the support); and ended my hike for the year at Mack’s Inn in Island Park, ID. Cell service was not always available and my blog updates became infrequent. I did manage to post a few photos on my Instagram account so if you are interested, check it out. Cottonwood Lake on the way to Anaconda, MT. No gear is more important to a hiker than shoes and I have been having shoe problems the past few weeks. Many hikers on the Continental Divide Trail wear trail running shoes which are slightly heavier running shoes designed for trails. Over the years I have leaned that trail runners usually don’t work that well for me and I need a more supportive shoe. I hiked the New Mexico section of the Continental Divide Trail wearing Vasque Breeze hiking shoes which worked pretty well, other than being slightly too narrow in the toes and the stitching failing. The shoes are about half leather and half mesh and the leather took a long time to dry when they got wet. When hiking around melting snow your shoes get wet a lot and that was one reason I looked around for different shoes when I started hiking again in Glacier National Park. Shoes from a company called Altra are very popular with long distance hikers so I decided to give them a try. The Altra’s worked well during training hikes but you never know how shoes are really going to work out until you hike four or five twenty mile days in a row. I should have known better. My right arch and outside of my foot was sore when I reached East Glacier. The hiker box at Brownies Hostel in East Glacier had a pair of Brooks Cascadia shoes in good condition that fit perfectly so I switched to them. The Cascadia shoes are more supportive with a somewhat stiffer sole. They were better for me than the Altra’s, but my feet were still hurting so it was shoe shopping time when I reached Helena, MT. A outfitter in Helena called Base Camp had a pretty good selection of shoes so I spent the morning trying on shoes and pacing about the store trying to imagine what they would feel like if I was walking on the trail. I ended up changing to some La Sportiva Primer Low shoes. I have now hiked from Helena to Anaconda in the new shoes and I think they are going to work out OK. I’ll know more soon. Next on the Continental Divide Trail was a four day hike from Lincoln, MT to McDonald Pass and nearby Helena, MT. On this section is trail my hiking companion was Elevated, a hiker from Australia. 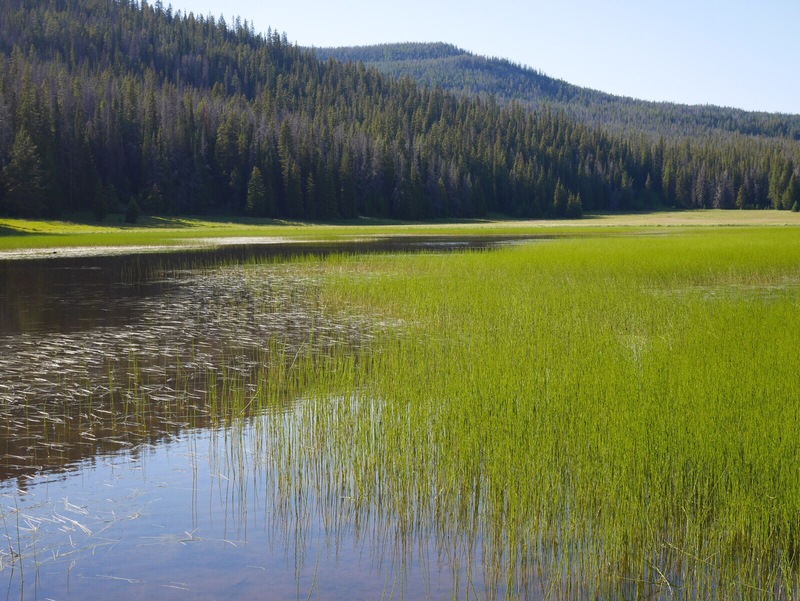 Most of the trail follows the Continental Divide through Helena National Forest. Hiking is often along ridges above the tree line with wonderful scenic views. On the second day we dropped down off the Divide on the Nevada Creek Trail to find water as storm clouds started to roll in. We decided to camp early in the relative shelter of a small valley as the winds blew, rain and later hail started to fall, along with loud thunder and lightning. I was very glad not to be on the ridgeline in all the weather. The next morning was a clear but cold and the weather had been good since. On the third day we reached Dana Spring and had a chance to visit with our first Montana cows at the water trough there. These are the first cows I’ve seen since New Mexico. They seem somehow friendlier up here and very comfortable around hikers. The cows didn’t seem to mind sharing the water trough, but they didn’t move out of the way either. We reached McDonald Pass and easily found a ride into Helena and checked into the hiker favorite Budget Inn Express motel. I will be taking a zero day here to rest, buy new shoes, and resupply.